All New York Islanders game-worn jerseys are accompanied by a letter of authenticity as well as an official New York Islanders security tag sewn inside each jersey. Customers are required to provide a valid credit card when an order is placed. Customers will be charged at the end of the designated time period that the jersey is worn and released by the Head Equipment Manager. All prices listed on the game-worn tab on the New York Islander website are in US dollars. Cash transactions can only be completed at the Islanders Team Store located by the box office in Nassau Veteran Memorial Coliseum in Uniondale, New York. The New York Islanders reserve the right to retain any jersey, including one that has been pre-ordered. We also reserve the right to limit the number of jerseys sold to a customer. Each customer is permitted to reserve one jersey per set (the sets are listed on the game-worn jersey link on the New York Islanders website). All sales are final when the order is placed. Yes, each jersey comes with a letter of authenticity and has a security tag sewn on the inside bearing the serial number that corresponds to the serial number on the letter of authenticity. New York Islander game-worn jerseys come to you exactly as they were worn during NHL games and therefore are not autographed. We do our best to respond within one week of your email or call and greatly appreciate your patience and cooperation. Why is there a limit to the number of jerseys I can reserve? To give each of our fans the opportunity to own a piece of Islanders history, each customer is limited to the amount she/he can reserve. All prices are set at the beginning of each season and are not negotiable. Game-worn jerseys are also excluded from Team Store sales and discounts, and may not be purchased using store credit. When should I expect to receive my jersey? 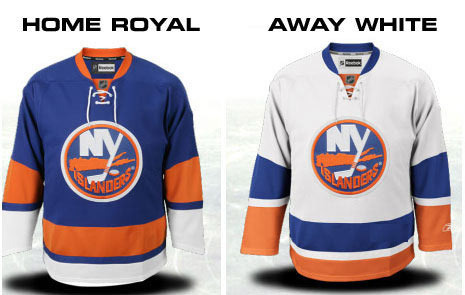 Each jersey set have their own release dates (the set release dates are listed on the game-worn jersey link on the New York Islanders website); however, there are no firm dates as to when each jersey will be taken out of circulation. Once a customer’s jersey is ready, we will ship it.